Shabby Fabrics just received the beautiful Snowbird collection from Edyta Sitar for Moda Fabrics. They have fat quarter sets of the prints and batiks available, as well as yardage. 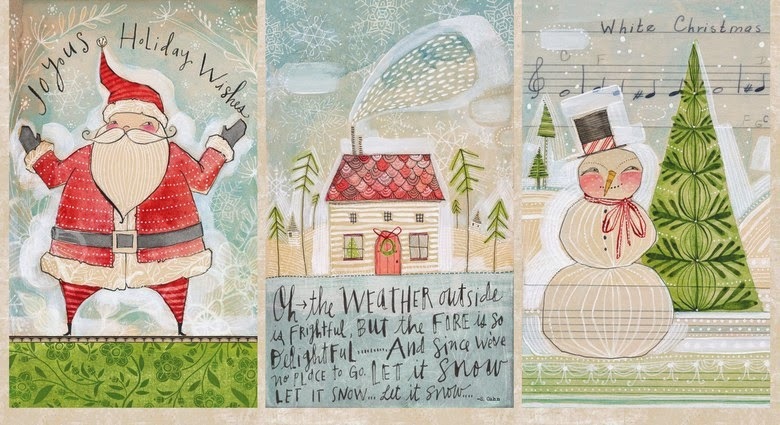 Sew Me A Song have just added Merry Stitches By Cori Dantini for Blend to the site. More prints will be added to the listing as well as a bundle but Becca said the photo she took last night was too rubbish to use so will be taking another this morning! This is a photo of the mail panel. 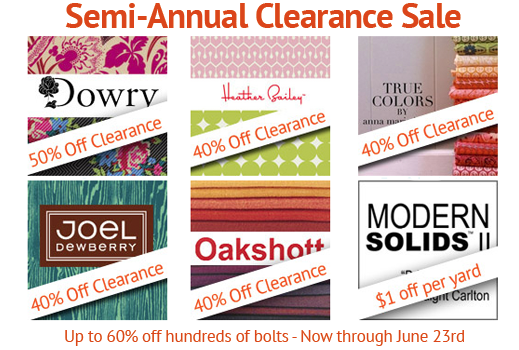 Marmalade Fabrics are having a semi-annual clearance sale with up to 60% off hundreds of bolts. Supplies are limited so act fast! 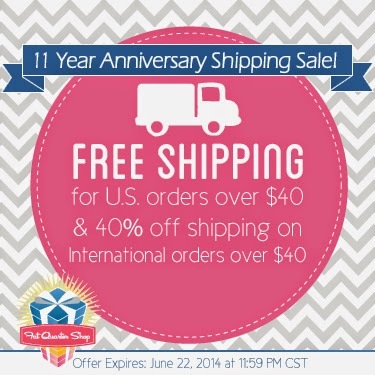 Fat Quarter Shop are celebrating their 11 year anniversary with a shipping special til Sunday June 22nd. All U.S. orders over $40 will have free shipping and all international orders over $40 shipping will have shipping 40% off. Southern Fabric have 20% off Scrumptious by Bonnie and Camille. Pink Castle Fabrics are selling subscriptions to the brand new quilting magazine, edited by Katy I'm a Ginger Monkey Jones. Duckadilly have just started selling Liberty charm packs. Celtic Fusion Fabrics have added 3 different scrap heaps to the website - there are 12 pieces in each heap - totalling half a yard - great for quilting, card making and mini crafts. Those scrap heaps look like fun!